Betty Harper Fussell is an American food writer who published a book about corn called: The Story of Corn. Anyone interested in browsing through her book may read long exerpts from it on GoogleBooks: here. If the exerpts are any indication of the whole, it is a book whose title belies lively content. 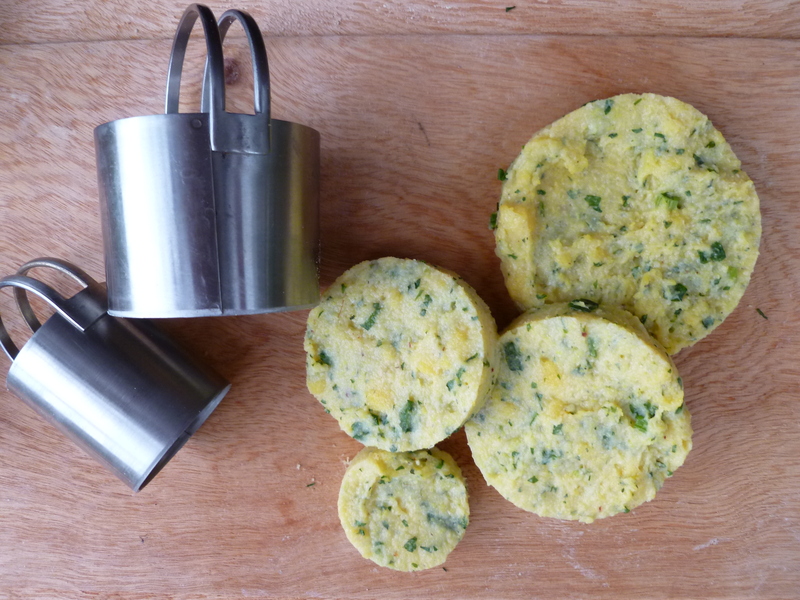 What Mrs. Fussell tells readers on the topic of the cornmeal and water mixture which is the basis of these Cheddar and Cornmeal Croquettes, begins with the simple observation: You Say Polenta, I Say Mush”. American colonists also used to say, “Hasty Pudding.” Polenta–Polente–Hasty Pudding–Mush–they are all one and the same thing. All over the world, people make it, add their unique extras, and call it their own. 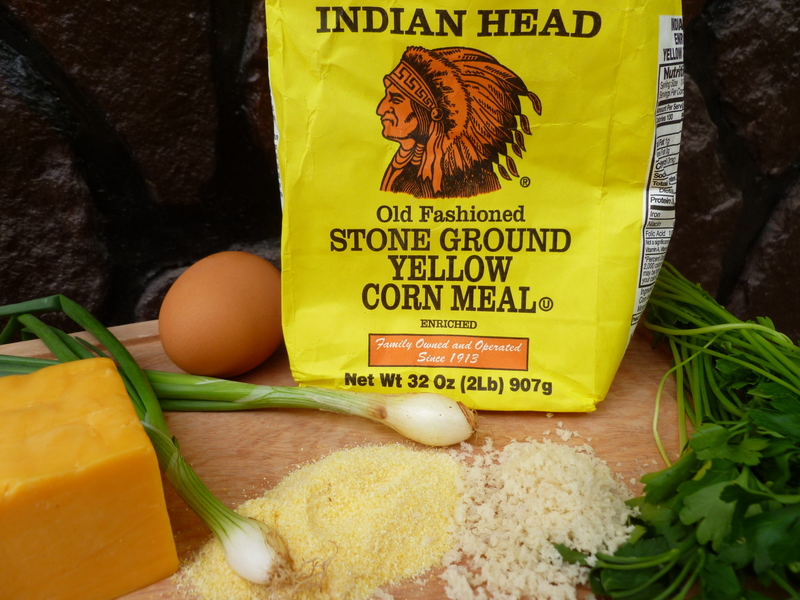 Cooked cornmeal and water is, according to Betty Fussell, everyone’s comfort food, and a national dish claimed by countless nations. And there we saw the men and boys as thick as Hasty Pudding. To hear the Pennsylvanians call thee Mush! He is not alone in wishing to make Mush sound grander. 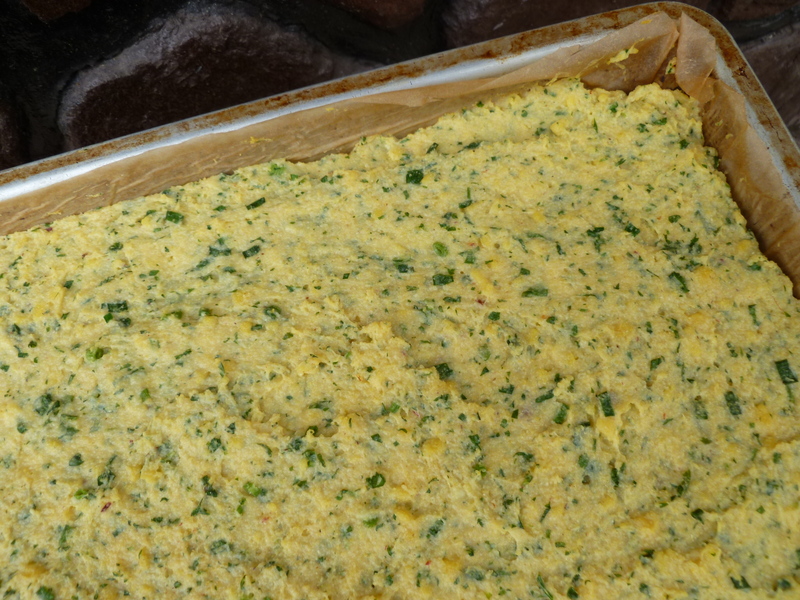 Mrs. Fussell says that early American cookbooks sometimes preferred calling it Polenta, possibly in the belief that a foreign name conferred a cachet on the cornmeal. 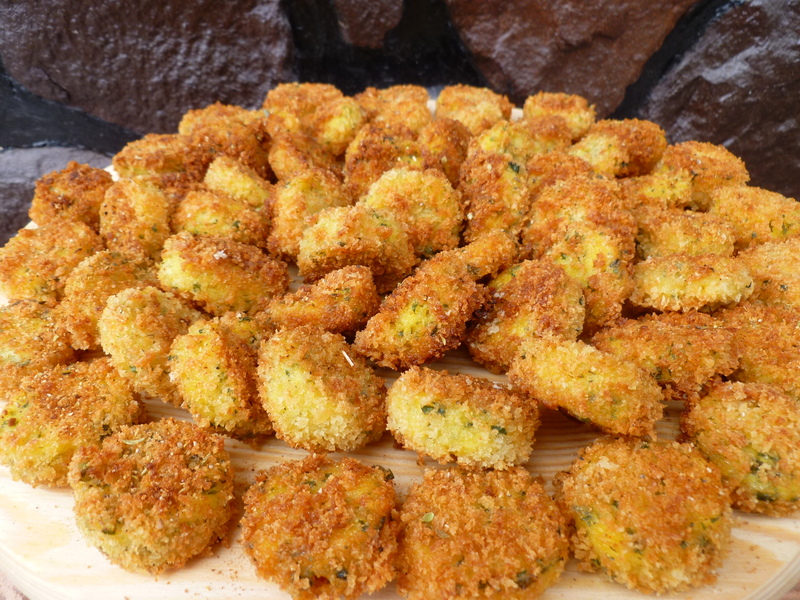 The Virginia Housewife used the Italian term in 1829 and, fifty years later, so did Dinner Year Book, which provided a precursor to the Croquettes described here with a recipe that suggested cutting up the mixture into squares and frying them brown. It is satisfying to discover a context for something…I realize now, that when writing out a Menu that included Cheddar and Cornmeal Croquettes with Carne Asada Powder, I was joining in a long national tradition of dressing up Mush to take it out. 1. Bring the water to a boil in the casserole or saucepan. Add the cornmeal little by little, stirring with the whisk. Add the salt. Lower the heat and cook the mixture slowly, stirring from time to time until the cornmeal and water is of a consistency that begins to pull away from the sides of the pot. 2. Remove the casserole from the heat and stir in the Cheddar, green onions, parsley, fresh coriander (cilantro), jalapeno and adobo sauce. 4. 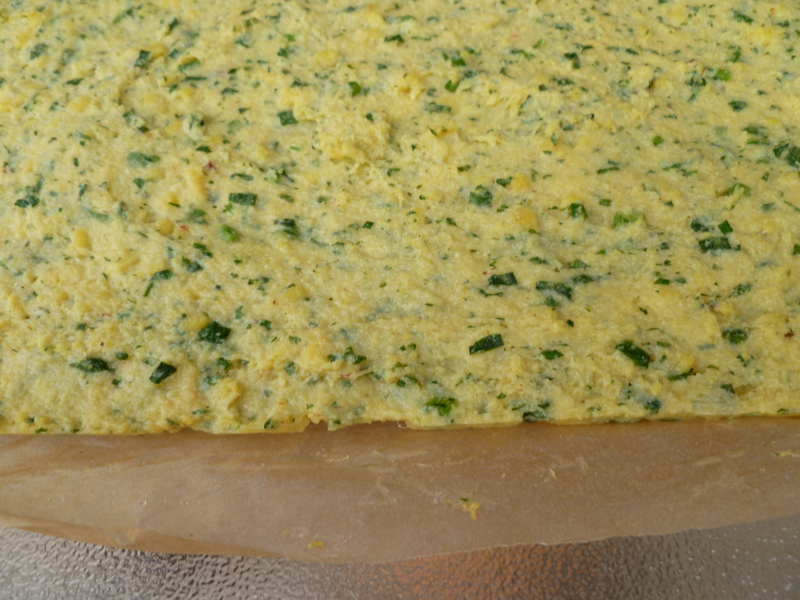 When the mixture has cooled, cover it with plastic wrap and refrigerate it. The croquettes may be made up to this point one or two days in advance. 7. Beat the eggs and milk together in a bowl. Pour some of the Panko out on a plate. Dip the croquettes in the egg and milk mixture and then in the Panko. As you bread them, place the croquettes on the waxed paper. 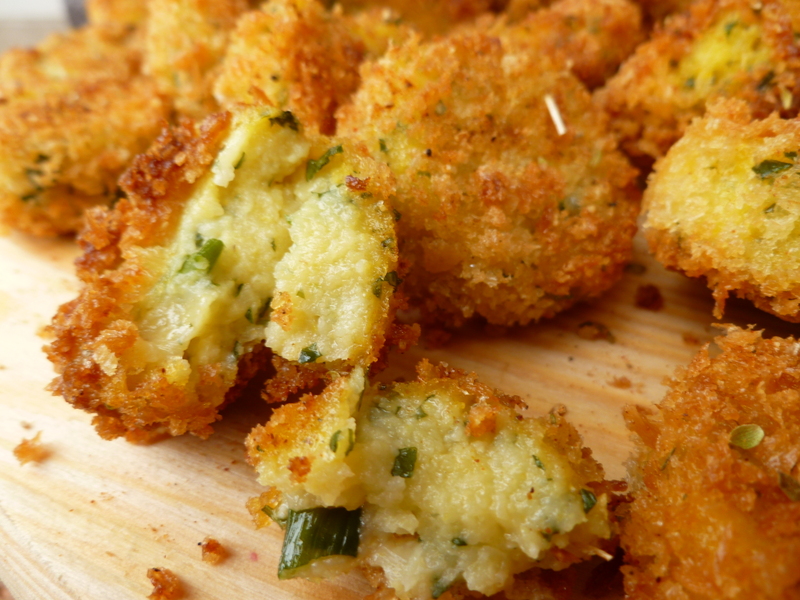 Leftover scraps may be reformed into a single piece to make more croquettes. 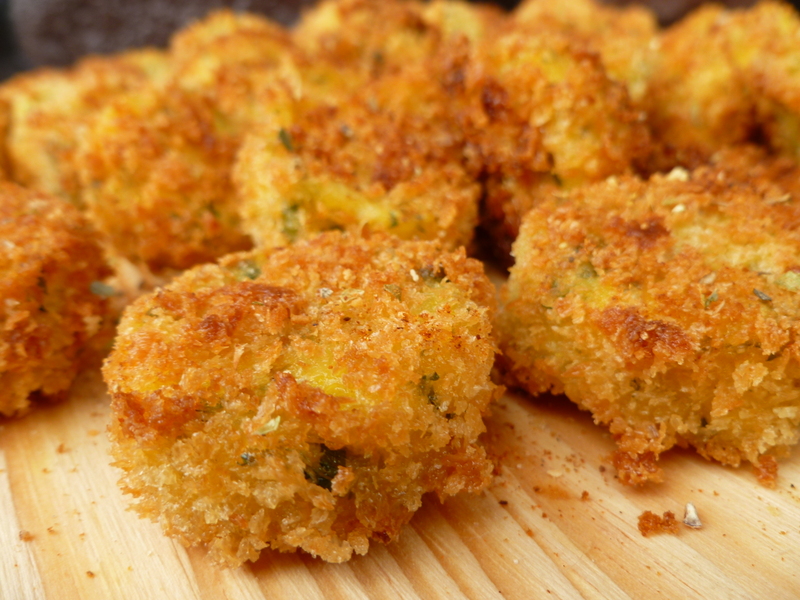 A Note: Cheddar and Cornmeal Croquettes with Carne Asada Powder are good served hot and at room temperature. They are easily reheated. These croquettes are an hors d’oeuvre in the Lunch Menu: Southwestern Elegance. But they are also nice to place on a salad, such as one or the other of the Salad Variations on an Arizona Theme with Peaches, Tomatoes and Cilantro, found here on the diplomatickitchen. 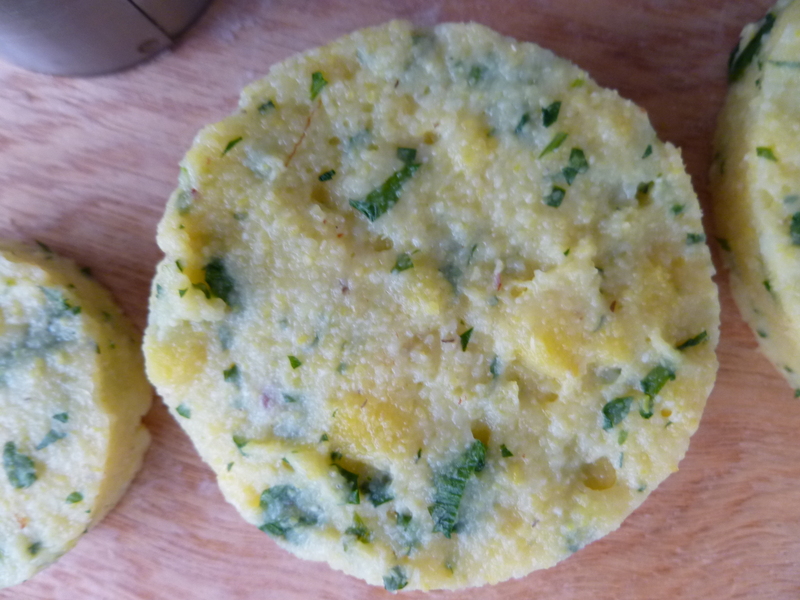 A Second Note: The diplomatickitchen expresses thanks to SeriousEats for ideas helpful in coming up with this version of Cornmeal Croquettes.